and make the world ever better. 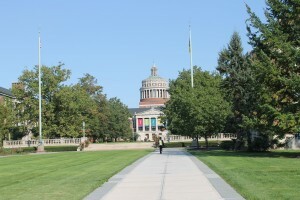 Over the past several years, the Universityof Rochester has made environmental sustainability a guiding principle in its many facets including facilities planning, curriculum development, and student-ledinitiatives. Countless efforts have been made towards the various projects of the larger “Go Green” effort. Among the most note-worthy accomplishments are the recycling collection events which have been offered to all University employees and students. By offering the Household Electronics Recycling collection and the Personal Documents Roundup, the University goes beyond its responsibility to preserve and protect the environment by properly recycling its own materials, and extends the same services out to the community free of charge. An additional benefit of these events which appeals to participants is the safety and security of confidential information. Any environmental advocate is aware of the risk that is posed on public health and environmental quality when toxic chemicals, such as lead and mercury, contaminate the environment as a result of electronic waste being improperly disposed of. New York State acknowledged the importance of this when the Electronic Equipment Recycling and Reuse Act was signed into law in May of 2010. The University of Rochester has been responsibly recycling its own electronics for many years. Last year alone the University recycled nearly 218,000 pounds (108.77 tons) of its own equipment. But as technology continues to advance, the University sought out a way to do its part to make the recycling of these devices more accessible to the public. In the Spring of 2008, the University offered its first collection event in which all employees and students could bring in their unwanted personal items in from home to have them safely and securely recycled. The event turned out to be so popular that it was decided to be offered again later the same year, and since then has become an annual Fall tradition. The daylong event is held in the campus’s Park Lot so that participants can stop by at their convenience to drop off their items. All sensitive data stored in the items collected during the event are destroyed through hard drive shredding and data wiping. mercury, beryllium, lithium, cadmium, BRFs (Brominated Flame Retardants), PCBs (Polychlorinated Biphenyls), and PVC (Polyvinyl Chloride, are segregated and collected during the dismantling process so that they are not released into the environment. Sunnking also pledges not to send waste overseas to developing companies, unlike some of its competitors. word got out to the community, the event became more successful each year and collected over 26,000 pounds in 2009 and then nearly 36,000 pounds in 2010. With the success in collecting household electronics, the University decided to expand on this concept by holding its first ever Personal Documents Roundup on July 15, 2011. The University, including the URMC Medical Center and Strong Memorial Hospital, securely destroys all patient related and confidential documents. In 2010, it recycled 560.75 tons (over 1,000,000 pounds) of paper through secure document shredding. Securely recycling personal documents was recognized as another opportunity as a service to extend out to the public. Often times individual are hesitant to place unwanted mail or documents into their recycling bins at home for fear of identity theft or that their personal information may end up in the wrong hands. So instead, they opt to hold on to such documents or place them into the trash. But the Personal Documents Roundup offers participants the opportunity to protect their identity and the environment. All material collected during the event is shredded onsite and the ultimately recycled. The format of the Personal Documents Roundup is very similar to that of the electronics collection, in that all University employees and students are invited to drop off their items at their convenience during the course of an entire day. If participants choose to, they can witness the shredding of their documents via the camera in the mobile shred truck provided by partner, Iron Mountain. The result of this event was extremely successful; over 6 tons of paper (12,390 pounds) were collected and recycled, which is equivalent to saving 102 virgin trees from being made into new paper. Participants immediately began asking when the next event would be and so the University decided that this event would also become an annual tradition. Even individuals who own paper shredders at home stated that the event is a much more convenient option.